The NEW Plantronics HW720 EncorePro headset for Professionals. This headset is the replacement for Plantronics "top-of-the-line" HW301N headset. 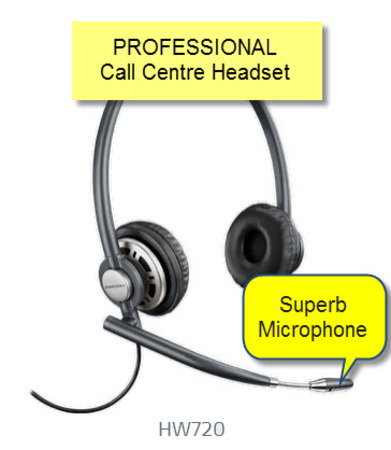 The HW720 is the highest performance headset for your highest performing employees. The Plantronics EncorePro HW720 headset delivers unprecedented style and performance to your professional staff. This headset is built with premium lightweight nylon composite materials providing an ultra-lightweight design - taking comfort to a new level. Soft plush leatherette ear pads provide all-day comfort, and the reinforced, lightweight headband provides strength and durability. The EncorePro's telescoping microphone ensures precise positioning so customers hear your every word. Plantronics HW720 EncorePro headset has two ears and headband that offers super comfort with superior audio clarity as well as sleek, polished looks. This headset requires a bottom cord or amplifier to connect to your telephone.